Queen Mary 2 Captain Kevin Oprey completed a mission today to deliver a blanket to lone transatlantic rower Mylène Paquette… albeit a little late. 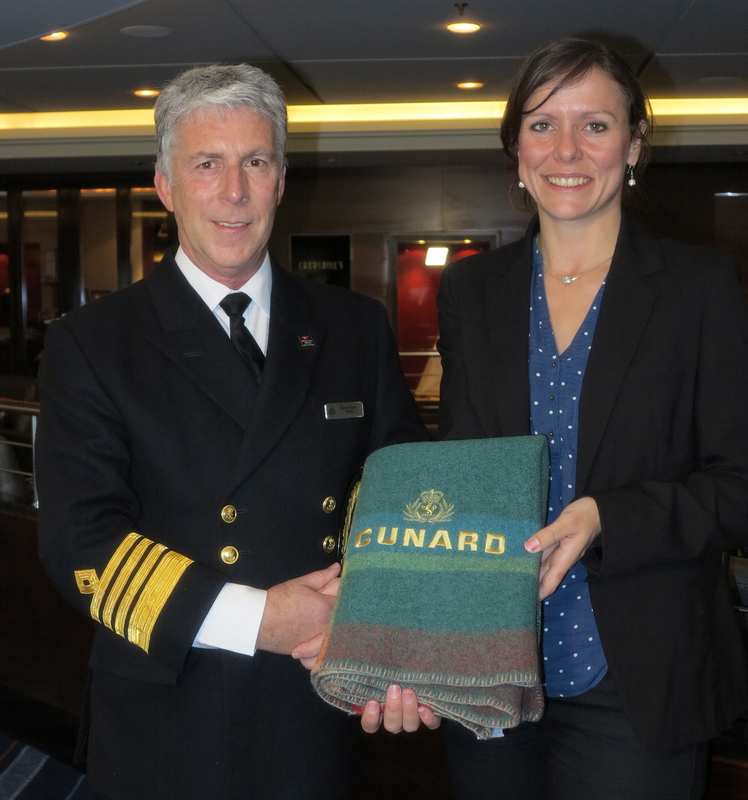 The Cunard gift, which was too big to include in an emergency package sent to 35-year-old Mylène in a dramatic mid-ocean encounter, was handed over in the more serene surroundings of the QM2’s Commodore Bar while the ship was docked in Southampton. It was the first time Capt Oprey and Mylène had met face to face – in their previous encounter in September they were separated by heaving waves as the 151,000-tonne ship floated out supplies including a replacement satellite phone and sea anchor to the French Canadian’s 7.3-metre-long vessel after she capsized in a storm. Equipped with her new gear – as well as a few treats such as chocolate and pastries – Mylène completed her 130-day, 4,500km (2,800-mile) voyage from Halifax, Nova Scotia, to Lorient, France, on November 12. A delighted Mylène thanked him for the ‘very nice gesture’ but assured the captain she had found some dry clothes after the capsize to keep her warm. Capt Oprey said on the night after QM2 helped Mylène, he looked out of his cabin window. ‘It was completely dark outside, I was thinking, “How could she cope with that?” How brave someone is to do that. This girl was out there in a tiny boat and big seas. ‘If your car breaks down in a dark country lane, you are concerned. Now put yourself 1,000 miles from land in a small cockpit on your own. That takes some character to do that. Oddly, Mylène undertook the transatlantic crossing partly because she is scared of swimming and hates being in the water. She said: ‘I really don’t like it, it’s like vertigo, I don’t know why, but even in the pool I don’t like to be alone. But with the help of a psychologist based in Britain, she managed to overcome her fear. During her voyage she weathered ten storms, battled 11-metre waves, crossed the paths of 30 freighters and suffered burns, blisters, back pains, asthma – and even mild concussion. She lost or broke many pieces of equipment. Finally, she arrived in France to be greeted by friends and family. She said: ‘It was like for the first time in five years I knew I could say that doing this had been a good decision’. Having been on board QM2 when the ship went to Mylène’s aid, I have followed her story closely so it was great for me to meet her face to face too. This entry was posted in News and tagged captain, Cunard, Kevin Oprey, mylene paquette, QM2, Queen Mary 2, Southampton. Bookmark the permalink.